Key difference: The LG Optimus L7 II Dual is a mid-segment phone from LG. The phone is a dual SIM phone. The device features a 4.3 inch IPS LCD, capacitive touchscreen with a resolution of 480 x 800 pixels. It runs on Android v 4.1.2 (JellyBean), which is backed by 1.0 GHz Dual-Core Qualcomm MSM8225 Snapdragon processor and 768 MB of RAM. Xperia J was announced in October 2012 as a cheaper variant of the Xperia T, resulting in the phone sporting a similar design to the T. The Xperia J features a 4-inch scratch-resistant TFT touchscreen that offers a pixel density of 245. LG Electronics is a business segment of LG Corporation. LG Corporation is the fourth-largest conglomerate in South Korea. It is known for its various products, such as home appliances, TV and Home Entertainment products, computer products, etc. One of these product segments includes mobile phones, namely the LG Optimus series. Some of the newer phones under this brand include LG Optimus G, LG Optimus L5, LG Optimus L7, etc. 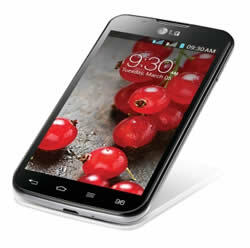 LG also recently announced the LG Optimus L7 II Dual. The LG Optimus L7 II Dual is a mid-segment phone from LG. The phone is a dual SIM phone. The device features a 4.3 inch IPS LCD, capacitive touchscreen with a resolution of 480 x 800 pixels. It runs on Android v 4.1.2 (JellyBean), which is backed by 1.0 GHz Dual-Core Qualcomm MSM8225 Snapdragon processor and 768 MB of RAM. The phone also has Adreno 203 for graphics support. The phone comes with a 2460 mAh Li-Ion battery. The phone features an 8-megapixel camera with autofocus and LED flash, as well as a secondary VGA camera for video calling and self shots. The primary camera can record videos at 720p resolution with 30fps frame rate, which is quite a decent video resolution. The phone also supports various camera features such as geo-tagging, zoom, Normal shot, Panorama, Continuous shot, Portrait, Landscape, Sports, Night, Sunset, etc. Some of the unique features on the phone are the Quick Switch Dual SIM Hot Key, which is a dedicated hot key allowing the user to switch between SIM 1 and SIM 2 with the push of a button. The phone also has a Real-Time Quicktranslator, which allows the user to scan a sign, a menu or anything else and translate it into another language. The feature recognizes 44 languages and translates into 64 languages. The LG Optimus L7 II Dual also has Cross-Tasking QSlide feature, which allows the user to simultaneously run two functions on transparent layer on the phone. The device also has an exterior Quick Button that provides quick access to the user’s favorite features and apps. Xperia is a well known brand of smartphones that are a part of the Sony Mobile. The Xperia brand was initially a collaboration with Ericsson but has since then been dissolved. Now, Sony has single handedly taken it upon itself to ship out new phones, while maintaining the level of quality and design of the older versions. 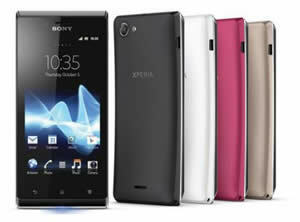 In order to garner response for its new line of smartphones, the company started marketing the Sony Xperia T as the Bond phone, which is featured in the movie Skyfall. Xperia J is the shy, younger brother of the Bond phone, and is also cheap to boot. The Xperia J was announced in October 2012 as a cheaper variant of the Xperia T, resulting in the phone sporting a similar design to the T. The Xperia J features a 4-inch scratch-resistant TFT touchscreen that offers a pixel density of 245. The pixel density is the not the best among the contenders, but that does not hinder the high-res display that is visible on the phone. The display shows quite smart and sharp images, with very accurate color representation. The display also has excellent viewing angles and does is less reflective under sunlight. The design of the phone is also quite similar to Xperia T. The phone comes with a plastic chassis that has a sturdy built. The Xperia J has an arched back similar to Xperia Arc series, which is pleasing to hold and grip. The silver plastic lining that graces the other Xperia series has been shifted to the bottom and acts as a second LED indicator during calls. The phone is also quite light, weighing only 124 grams. The Timescape UI is very similar to the original Google Android UI and basically seems like cheap imitations. The phone has three capacitive buttons on the bottom of the screen, Back, Home and Menu buttons. The buttons are placed on the far bottom of the device, making it more prone for the user to drop the device. The top of the device houses the 3.5mm jack, while the left side has the USB/charging port. The right side of the device is quite busy with the power/lock key on the top right hand and the volume rocker just below the power key. The device is powered by 1 GHz Qualcomm processor and only 512 MB, which makes the device a little glitch and lagging when trying to shift screens as well as switch apps. The device, when not multitasking and doing basic functions, still lags a little. The device comes with 4 GB of internal space, of which only 2 GB is available to the user. This is very little compared to phones that are offering 8/16/32 and even 64 GB. However, the company has provided a SD card slot that allows users to expand memory by another 32 GB. The device houses a 5 MP rear camera with autofocus feature. Just above it, a LED flash light can also be found. However, the front camera and the video recording capabilities are a little disappointing. Both, the front camera and video recording are VGA, which does provide the best resolution. The 5 MP camera is pretty decent, but if you have gotten used to the high-res 8 and 12 MP cameras, this camera will not at all be pleasing. The camera takes decent photos, but it isn’t sharp, clear or even HD for that matter. However, the phone does come with juice, 1750 mAh to be exact. This ensures that the phone last a couple of days when not in constant use and at least a full day when working with it all day. The company does offer features such as Wi-Fi hotspot, Bluetooth and USB, but it does not offer NFC capabilities. The information for the detailed table about the two phones has been taken from the LG website, Sony Mobile website and GSMArena.com. GPRS, EDGE, WLAN, Wi-Fi hotspot, Bluetooth and USB.